A Sergio Aguero hat-trick undid Arsenal as Manchester City picked up all three points with a 3-1 win at the Etihad Stadium. It was vital that Arsenal started well in this enormous match but unfortunately, they did not. 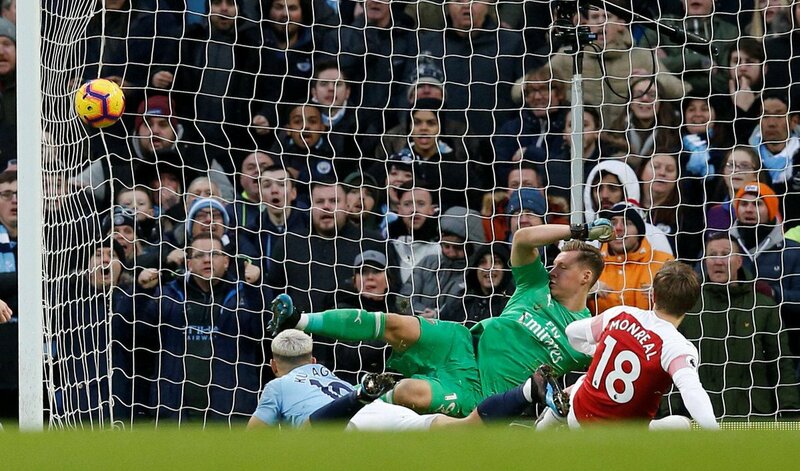 The Gunners were put under immediate pressure and buckled as Alex Iwobi lost possession on the edge of his own box, allowing a simple cross for Sergio Aguero to open the scoring within a minute. It was a confidence-killer for the Gunners as a rampant City almost made it 2-0 within the opening five minutes. Kevin de Bruyne swung in a freekick and Aymeric Laporte headed the ball in but the goal was ruled out for offside. Arsenal crossed the halfway line for the first time around the nine-minute mark and grabbed a corner from the move. Lucas Torreira swung it in and Nacho Monreal’s flicked header found the onrushing Laurent Koscielny who headed the Gunners level. Unai Emery’s side really settled into the match after that equalising goal. City struggled to string their passes together, something which Arsenal started to thrive at. Matteo Guendouzi controlled the midfield brilliantly for the Gunners as City really struggled to find a way past the Frenchman and Torreira alongside him. Unfortunately for the visitors, City got things right before the half was out. A flowing move resulted in a driven ball across the face of Arsenal’s goal where Sergio Aguero was on-hand to make it 2-1. City came out the stronger side after the break and Arsenal suddenly looked unable to get out of their own half. The home side flooded forward and the Gunners just didn’t adapt in time. Sergio Aguero grabbed his – and City’s – third goal of the match on the hour-mark. Unai Emery made some changes after the third goal but by then, the match was over. The final 30 minutes ticked by with little in the way of chances for either side as City picked up all three points. 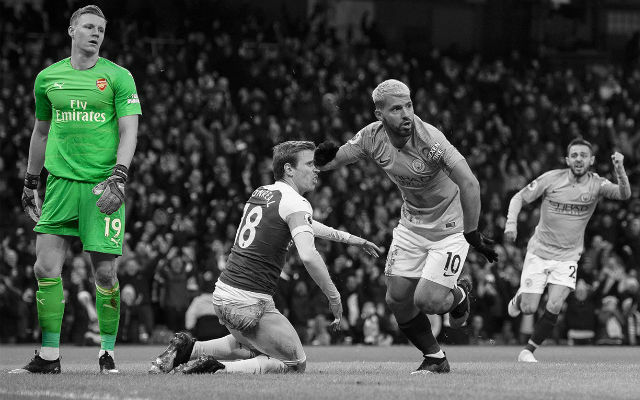 It’s hard to blame Bernd Leno for anything today. The German couldn’t have done much more for any of City’s goals and made a string of good saves. Positionally, Stephan Lichtsteiner had a fairly good game. His defensive movement was sound for the most part but the Swiss international’s night came undone in one-on-one encounters. He struggled this evening. Shkodran Mustafi was caught out of position on a number of occasions and couldn’t live with the movement of City’s attackers. He was okay. 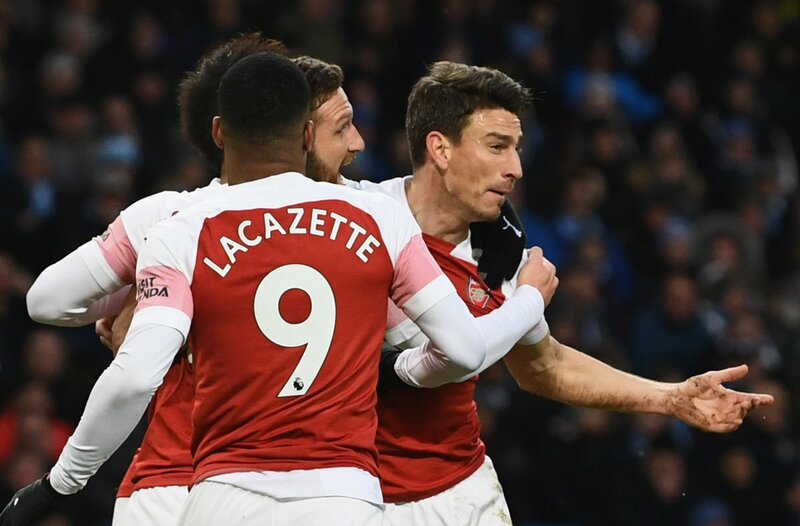 Laurent Koscielny grabbed an important goal and had some good moments in the first half but he looked a little more exposed after the break. Nacho Monreal did well enough. An ineffective performance from Sead Kolasinac. Unai Emery effectively played the match with two left-backs but Kolasinac offered little at either end of the pitch. A debut to forget. He struggled out there. Matteo Guendouzi was excellent in the first half. The Frenchman shone in a congested midfield and showed an excellent range of passing to get his side going. Guendouzi tired after the break but can still be pleased with his night. Like his midfield partner, Lucas Torreira put in an exceptional first 45 minutes but looked a lot less comfortable after the break. The Uruguayan was solid defensively with a host of blocks, clearances and interceptions but there were just too many City players for him to cope with. Alex Iwobi did well in the first half as he helped Arsenal move from defence to attack but tired after the break. A quiet one. Alexandre Lacazette just couldn’t get into the match and barely had a sniff of a chance on the night. He looked tired. He cut an isolated figure up front. Pierre-Emerick Aubameyang just couldn’t get the service he needed during the match.